Elder Neal A. Maxwell of the Council of the Twelve will rise, step around the desk, and come forward to meet you as you enter his office. Then he will turn the time you spend with him into an unusual experience in love. You will feel that all his attention is focused on you, on what you are saying. He is trying to grasp what you mean and sense how you feel. “The word focus is a key with him. He can focus his energies on the part that matters, just like a lens focusing light,” Sister Haglund explains. It is an apt description of his ability, his gift in working with people, and his personal productivity. Neal Ash Maxwell has had both personal experience and powerful examples to teach him the value of seeing people and events through that lens of the gospel. Born 6 July 1926, the eldest of six children of Clarence and Emma Ash Maxwell, Neal grew up in what was then a semirural area of Salt Lake Valley. His interests included sports and animals (at one time he thought of becoming a veterinarian). His ability in writing was apparent even before high school, but he began to hone it after he was challenged by a wise teacher to perform at a higher level. In 1944 Neal graduated from high school and soon found himself in military service. Before the war ended, he fought on Okinawa. His writing ability was employed in preparing commendations for soldiers who were to receive medals and in composing letters to families whose sons had been killed. Drafting those letters furnished lessons in compassion for the young soldier. After his discharge, he served a mission in eastern Canada. He did not wait for the bishop to call him in for an interview, but went to the bishop to explain that he wanted to be called. He paid for his mission with money saved from his military service. His writing skills were employed again when he wrote a new teaching plan that was used in his mission and others. Following his mission, he entered the University of Utah, where he completed a degree in political science in thirty months. Colleen graduated and went to Arizona to teach school, but when she returned home the following summer, she and Neal Maxwell began to date. They were married that fall﻿—22 November 1950﻿—in the Salt Lake Temple. 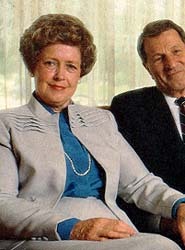 After his graduation, the couple moved to Washington, D.C., where Neal worked for most of the time on the staff of Utah Senator Wallace F. Bennett. It was a time of growth for him, and a time in which he increasingly brought the gospel into use as a lens to view the world. The experiences he had would later shape his teaching and writing as an instructor in political science at the University of Utah. In the late 1960s and early 1970s, after community and academic service in Utah made him highly visible and politically “marketable,” there were those who wanted to back him in a campaign for state or national office. But “one of the paradoxes of my life is that as I became more marketable, my interest went down,” Elder Maxwell recalls. “While I respect and am grateful for public servants, that wasn’t what I wanted for my career.” He had come to feel that his life could have more value if devoted to service in the Church, the community, and the academic world, where it would affect not so much institutions as individuals. Ironically, it was his return to Utah in the mid-1950s to work in Senator Bennett’s reelection campaign that took him away from politics. He learned of an opening in the public relations department at the University of Utah, and Colleen suggested he apply. Her reasoning was that at the university he might find greater opportunities to serve people. He was hired, and that later led to his becoming an assistant to the president, dean of students, and finally executive vice-president. As a university official in the 1960s, Brother Maxwell was deeply involved in public service. He was, for example, the citizen chairman of the Utah Constitutional Revision Commission. He also proved to be very effective in representing the interests of the university, and of higher education in general, before the state legislature. He helped Utah increase communication among the presidents of the state’s institutions of higher learning and stressed the value of higher education to the citizens of the state. 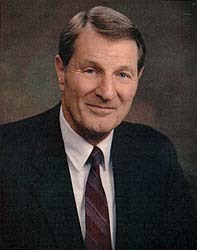 Attorney Ed Clyde served on the Constitutional Revision Commission while acting as head of the institutional council for the University of Utah. Neal Maxwell, he says, “is very bright. He is very articulate. He is willing to stand up and be counted on any issue, but he does it gently.” The university vice-president’s readiness with the facts to support his position, along with his willingness to be sure the viewpoint of others was heard, helped win him both respect and friendship during those years of public service. Experience in the academic community helped confirm feelings that had begun to take shape in Washington. “In a way, the university helped me see that the gospel’s ideas were not only the answer, but they could stand up under scrutiny,” Elder Maxwell reflects. He found that the political ideas in Mosiah 29, for example, had powerful practical applications. Part of his skill in applying gospel principles to challenges of the world may have been learned through association with President Harold B. Lee. Before his calling as a General Authority, Neal Maxwell served the Church as a regional representative and in other callings that required him to work closely with Church leaders. “From President Lee, I derived this great sense that the Church need not be afraid of the truth, that we could draw upon men and women for whatever they had that was useful or true or praiseworthy, and that we needn’t fear or hold back,” Elder Maxwell says. He recalls one visit with President Lee to a less-active member who had skills the Church needed in a particular area. President Lee drew out of the man what they needed to hear﻿—and at the same time lovingly taught the man what he needed to do in his own life. In 1970, Brother Maxwell left the University of Utah to accept the position of Church Commissioner of Education. Four years later, he was called as an Assistant to the Twelve, then to the Presidency of the First Quorum of the Seventy when that quorum was organized in 1976. He was called to the Quorum of the Twelve in 1981. It was President Spencer W. Kimball who called Elder Maxwell as an Assistant to the Twelve, and also as a member of the Twelve. The first call came when President Kimball, then a member of the Maxwells’ ward, simply dropped by their home one evening, catching Elder Maxwell relaxing in his stocking feet after a hard day. But the second call, to the Council of the Twelve, was a stunner since there was no vacancy in the quorum at the time. (Elder Maxwell was called to the quorum at the same time President Gordon B. Hinckley was called as a third counselor in the First Presidency.) It came while Elder Maxwell was in the recovery room at a hospital after surgery. Elder Maxwell had thought at first that the hospital visit was simply part of President Kimball’s loving solicitude toward others. Elder Maxwell has also acquired a perspective about service through associations with the Church’s current president. “President Ezra Taft Benson’s constant criterion﻿—‘What’s best for the kingdom?’﻿—will be something of a hallmark of his administration. It is a test each of us needs to apply, and if we will, we will save ourselves much misery and create more felicity in the lives of others,” Elder Maxwell comments. Like many of his colleagues among the General Authorities, Elder Maxwell performs his own quiet ministry to individuals. Close associates know that there is in his mind a long, private list of people who might benefit from personal help or encouragement. Part of his compassion is a rare gift for giving those in need the feeling that they are needed, that they are the contributors. Diane Ellingson, a champion gymnast, lost the use of her legs a few years ago after a tragic accident during a workout. As Sister Ellingson has gone on with her life, learning a variety of ways to serve others, she has always had the encouragement of Elder Maxwell. His thoughtful acts include sending cards at Christmastime and delivering a copy of his latest book as each is published. “I think I am just one of the people he has reached out and touched,” Sister Ellingson says. Elder Maxwell’s sensitivity to the needs of others seems finely tuned when it comes to his family. Cory, the second of the Maxwell’s four children (after older sister Becky and before Nancy and Jane), remembers that he received a timely call from his father once while living away from home. It was evident from the conversation that Elder Maxwell knew his son needed counsel at that particular time. Supper conversation at the Maxwells could be entertaining, recalls daughter Nancy Maxwell Anderson. Her father’s quick wit and commentary would keep the family laughing. When his children were younger, he often found a more intimate way to express his feelings to them. There were memorable one-on-one chats. And there were occasional letters. Deeply personal, they were tailored for the individual child and dwelt on the strengths of the person to whom they were addressed. They were especially important indicators of his love during the teen years, says Becky Maxwell Ahlander, the Maxwells’ oldest child. But they have continued to come since her marriage. Always, there was a great sense of his love and trust. “I think he makes you want to be better,” Jane reflects. When their children married, the Maxwells extended the family circle of love to their son’s and daughters’ spouses; the coming of grandchildren simply allowed the circle to extend farther. Nancy and her husband Mark live nearby, and her father frequently stops on his way home to visit his grandchildren or to stay with them while Nancy runs to the store for something. He may call during the day to check on one of them who has been ill or has some kind of need. Becky and her family live an hour’s drive away; he calls almost daily to inquire about their welfare. The grandchildren love to hear the Tweedle Dum and Tweedle Dee stories he used to tell to their parents. Rarely are the stories, about two forest rabbits and their friends, repeated; usually they are made up on the spot as he lies on the floor with the grandchildren around him. Because Jane and her family live far away, he has taped some of the stories and sent them to her children. He brings the same intensity to his writing. He reads widely, virtually devouring material from newspapers to works of history, biography, and philosophy. It is a key to his writing. “He reads, he absorbs ideas, and then he organizes the ideas to contribute to the kingdom,” Sister Haglund says. He is never without a writing project now, Colleen Maxwell says. “For the most part, he does it while he is traveling. Wherever he is, he has a little notebook. If he gets a thought, he jots it down.” He has written seventeen books, along with uncounted articles, talks, and other materials. “He will invariably ask me or the family for suggestions on talks or book manuscripts,” Sister Maxwell says. “I don’t know very many people who are as good at taking feedback as he is. He isn’t sensitive about honest feedback. He seeks it.” Becky was impressed when, as a teen, she suggested an addition to something he had written, and he expanded on her idea for several paragraphs. It was his wife who originally encouraged him to write books. She has supported him in so many other ways as well, particularly in his calling, that “he says he couldn’t do it without her,” Nancy comments. For example, Jane adds, she has never heard her mother complain about the timing or length of Elder Maxwell’s absences from home because of his Church assignments. Instead, Sister Maxwell may tuck an affectionate note or her husband’s favorite candy bar into his luggage as a reminder that she is thinking of him while he is away. Elder Maxwell expresses gratitude for his wife’s example in her thorough scripture study and says he learns much from their gospel discussions. She is a “more complete” Christian than he is, he explains; she has a high desire to serve and a low need for recognition, furnishing a good example for him and their children. His wife says in turn that it has been “a sweet experience” to be close to him through the years and see his knowledge of the gospel and love of the Savior develop. “I think he has changed a lot. I have seen his desire to increase his effectiveness and to improve,” she comments. “And I have seen how the Lord has worked through him and how he has been magnified. It has been a pleasure to be party to that. “I don’t mean to paint him as a saint. He wouldn’t want that, and I wouldn’t want that to be conveyed, because he is human,” Sister Maxwell says. But “the things of the Spirit and the gospel and the kingdom are much more important to him than other things. Others have noted that special quality about Elder Maxwell’s life. Joseph Rosenblatt, a distinguished non-LDS businessman and long-time friend, comments that becoming friends with men of Elder Maxwell’s caliber﻿—men for whom heaven clearly has a mission﻿—is rare in one’s lifetime. Like Mister Rosenblatt, many of us have felt the special calling and power of Elder Neal A. Maxwell. There is no doubt that in focusing the light of the gospel on others, to illuminate their lives and help them contribute more, Elder Maxwell has been illuminated and changed by that light himself. Photography by Eldon Linschoten and Jed A. Clark. (This page, left) Neal Maxwell received an honorary degree from the University of Utah in 1969. (Center) Young Neal at about age four. (Right) Elder Maxwell at general conference. (Left) Neal Maxwell in 1944, when he was a member of the U.S. Infantry. (Right) Elder and Sister Maxwell with their children and grandchildren. Left: Neal and Colleen Hinckley Maxwell on their wedding day, 22 November 1950. (Right) Elder Maxwell enjoys organizing games with his grandchildren. (Left) Neal Maxwell, a University of Utah vice-president, with the Board of Regents and National Advisory Council about 1968. (Center) Brother Maxwell was appointed Church Commissioner of Education under President Harold B. Lee in 1970. (Right) Elder Maxwell in Ghana, West Africa, where he dedicated the region’s first chapel in 1985.